There are many excellent R resources for visualization, data science, and package development. Hundreds of scattered vignettes, web pages, and forums explain how to use R in particular domains. But little has been written on how to simply make R work effectively—until now. 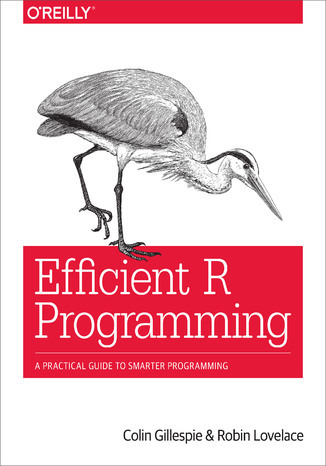 This hands-on book teaches novices and experienced R users how to write efficient R code. Drawing on years of experience teaching R courses, authors Colin Gillespie and Robin Lovelace provide practical advice on a range of topics—from optimizing the set-up of RStudio to leveraging C++—that make this book a useful addition to any R user’s bookshelf. Academics, business users, and programmers from a wide range of backgrounds stand to benefit from the guidance in Efficient R Programming. What Is Efficient R Programming? Native Binary Formats: Rdata or Rds? Background: What Is a Byte?